Leaf spots typical of apple scab on apple. What is apple scab? 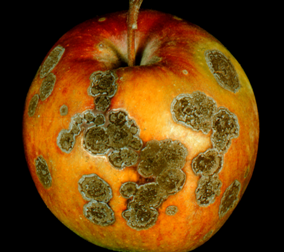 Apple scab is a potentially serious fungal disease of ornamental and fruit trees in the rose family. Trees that are most commonly and severely affected include crabapple, hawthorn, mountain-ash, apple and pear. 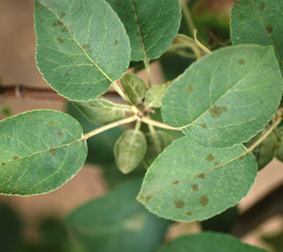 In ornamental trees, leaf loss caused by apple scab can make trees unsightly and aesthetically unappealing. In fruit trees, leaf loss can reduce fruit yield. In addition, the presence of apple scab on fruits can make the fruit difficult, if not impossible, to market. What does apple scab look like? 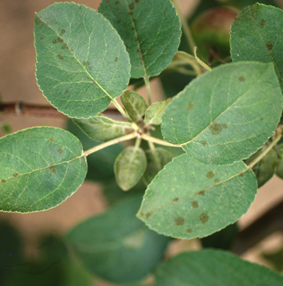 Apple scab lesions (diseased areas) are often first noticed on leaves, where they most commonly occur on the upper leaf surface. Fruits are also very susceptible to infection. Lesions on both leaves and fruits are roughly circular with feathery edges, and have an olive green to black color. Lesions can be as small as the size of a pinhead or as large a ½ inch in diameter. When disease is severe, lesions can merge and cover a large portion of the leaf or fruit surface. Defoliation of a tree (i.e., extensive leaf drop) often follows. Where does apple scab come from? Scab is caused primarily by the fungus Venturia inaequalis. 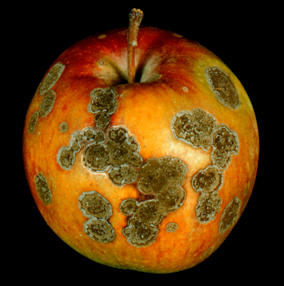 Other species of Venturia can be involved in diseases similar to apple scab. In particular, Venturia pirina causes a very similar disease (called pear scab) on pear. Venturia inaequalis and its relatives survive the winter in leaf litter from infected trees. Scab is most severe in cool, wet years. How do I save a tree with apple scab? Apple scab is not a lethal disease, even when trees totally defoliate. Once symptoms are visible, it is too late to treat a tree. Proper long-term management of apple scab is important however. If left unchecked, defoliation due to apple scab year after year can stress a tree and make it more susceptible to other, more serious and lethal diseases and insect pests. How do I avoid problems with apple scab in the future? If your crabapple, apple or pear tree has a history of severe scab, consider replacing it with a resistant variety. See UW-Extension Bulletins A2105 – ‘Apple Cultivars for Wisconsin”, A2488 – “Home Fruit Cultivars for Northern Wisconsin”, and A2582 – “Home Fruit Cultivars for Southern Wisconsin” (all available at https://learningstore.uwex.edu/) for recommendations. If you have a susceptible tree that you want to maintain, carefully collect up and discard fallen, infected leaves each autumn. These leaves are a major source of spores that can infect leaves the following growing season. Also, be sure to routinely thin your trees to open up the canopy and allow better airflow. Thinning will promote more rapid drying of leaves which is less favorable for apple scab development. Even with proper fall leaf clean up and thinning, you may have to consider applying fungicide treatments to susceptible trees, particularly when the weather is cool and wet. Captan, chlorothalonil, mancozeb, myclobutanil, propiconazole, or thiophanate methyl, are available for apple scab control, although not all of these active ingredients can be used on trees where fruit will eventually be eaten. Be sure to read and follow all label instructions of the fungicide(s) that you select to ensure that you use the correct fungicide(s) in the safest and most effective manner possible. Typically, you will need to treat every seven to 14 days from bud break until wet weather subsides. DO NOT use myclobutanil, propiconazole, or thiophanate methyl as the sole active ingredient for all treatments. If you decide to use one of these active ingredients, alternate its use with at least one of the other active ingredients listed above to help minimize problems with fungicide-resistant strains of the apple and pear scab fungi. Typical scab lesions on apple fruit.